The calm waters of the Arabian Gulf are becoming more popular with regular cruises within the region. Dubai is the primary turnaround port and ships often offer overnight stays in this city. Culture and history are the pride of the Gulf States and there's much to see in each of the popular ports of call. The ancient markets are full of colour, charm and atmosphere – whilst the modern air-conditioned malls rival any to be found in Europe. The warm weather of the Gulf region provides ideal cruising conditions on calm seas from December until April and is a popular choice for those looking for a winter getaway – combining a short cruise with a stay in a five-star hotel in Dubai. 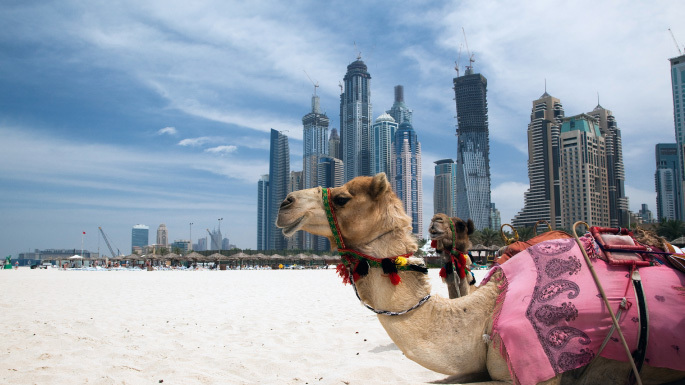 The waters around Dubai and the Emirates have traditionally been the home of ancient Arab dhows and vast merchant ships, which trade between its oil rich nations and the rest of the world. It is only in the last few years that there have been regular cruises within the area. It's clear to see that opulence and affluence are in abundance in this part of the world, and with countries like Oman and Qatar also nearby, it is great to get a feel for what life is like here. Our Dubai and Emirates cruises often also include stops in the Mediterranean as part of their itineraries; allowing you to take in various different cultures during your trip.